Grades: The content is easy to read, but younger readers may miss the depth of this book. We recommend it to emotionally mature 8th graders and up. Plot: Where Things Come Back contains two interlocking story lines that seem unrelated initially but connect powerfully by the end. One is the story of Cullen, who has just finished his junior year of high school in tiny Lily, Arkansas. His summer is an especially tumultuous one: addition to facing the hallmark social and romantic trials of a teenager, he must cope with his cousin’s drug-induced death and then his adored younger brother’s sudden disappearance. While Cullen is obsessed with finding his brother, his town is obsessed with the alleged sighting of the largest woodpecker in existence, previously thought to be extinct. The aptly named Lazarus woodpecker seems unrelated to Cullen’s story, but readers should keep an eye on this important symbol. The second story line begins with eighteen-year-old Benton’s sudden recall from his religious mission in Ethiopia, which results in his revered father’s anger and shame. Cullen and Benton never meet, but each inadvertently sets off a series of actions that will collide and permanently alter the lives of those around them. This novel is equal parts dark humor and heartbreak, but it ends with an unambiguous rush of warmth and joy. Young readers will finish the book quickly but find themselves pondering its meaning for a long time. Adult Content: Seventeen-year-old Cullen, the protagonist, is sexually active, and frequent references are made to his sexual encounters with girls, though none are described in any detail. The sexual content of the book won’t be objectionable to most parents, but some might want to skim it first if they’re worried. The book also contains some profanity—on par with a PG-13-rated movie, or so—and there are references to drugs in the beginning of the book, though since Cullen’s cousin dies of an overdose, it’s safe to say that drug use is not glorified. 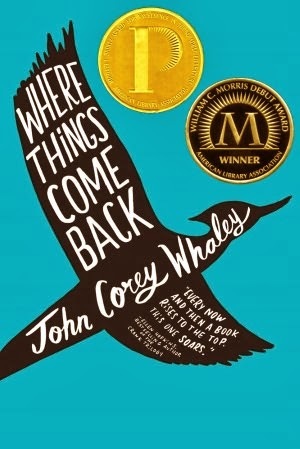 Our Take: Where Things Come Back is brimming with profound symbolism, and there is a richness to its multitude of themes that would make it a great starting point for innumerable discussions about topics as varied as family, friendship, grief, fame, hope, religion, expectation versus reality, coping, imagination, conformity versus individuality, redemption, forgiveness, destiny, and love. We were intrigued not only by the richness of the individual characters, but of their relationships to each other and their surroundings. While we recommend this book, it’s important to point out that struggling readers might have a tough time with it. Although the language is not overly complicated, the plot can be tricky to follow. Benton’s story begins, chronologically, several years before Cullen’s narrative, though the two stories are told side by side. Making two timelines, one for each story line, and filling them in as the book progresses, will help. Another thing that makes this book tough for weaker readers is Cullen’s imagination. He is frequently lost in his own fantasies, which are shared in vivid detail and begin with little warning. Most of them tend to turn out involving zombie takeovers or talking woodpeckers, but before the absurdity sets in, the tone is so similar to the tone of the rest of Cullen’s chapters that some readers may find it difficult to tell the difference between Cullen’s daydreams and his reality.